Rameau Thierry Sokoudjou Nkamhoua (French pronunciation: ​[ʁamo tjɛʁi sɔkudʒu]; born April 18, 1984), mostly billed simply as Sokoudjou, is a Cameroonian professional mixed martial artist. A professional competitor since 2006, Sokoudjou is the former KSW Light Heavyweight Champion, and has also competed for PRIDE, the UFC, WEC, Affliction, Strikeforce, K-1, DREAM and Bellator. Born and raised in Cameroon, Sokoudjou began training in judo at the age of five and was talented, winning three consecutive junior national championships from 1997-1999 in his home country. Growing up, he had actually wanted to get involved with boxing or kickboxing but his parents would not allow it because they thought the competition was too violent. Sokoudjou moved to the United States in 2001 to pursue his career in judo. Sokoudjou was the 2001 US Open Judo Champion as a member of Judo America San Diego, California. Sokoudjou began training for mixed martial arts after helping Dan Henderson train for an upcoming fight at Team Quest. 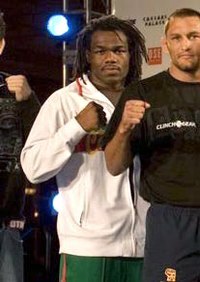 Sokoudjou made his professional debut in 2006 in San Diego, on a card that also featured future UFC Bantamweight Champion Dominick Cruz and future UFC Flyweight Ian McCall. Sokoudjou won his bout via split decision and then won his next fight less than a month later, by TKO. Sokoudjou then fought against future UFC veteran Glover Teixeira at WEC 24, but lost via knockout. In his PRIDE debut at PRIDE 33, Sokoudjou fought legendary Brazilian fighter Antônio Rogério Nogueira, and the much-less experienced Sokoudjou was a 16-1 underdog. To start the match, the Cameroonian threw a series of high kicks before landing an excellent combination that knocked out "Lil Nog" at just 23 seconds into the first round in a shocking upset. This made Sokoudjou the first fighter to finish the younger Nogueira brother. Sokoudjou's victory is considered to be one of the biggest upsets in mixed martial arts history, as well as arguably the biggest win of Sokoudjou's career to date. Sokoudjou was then matched up against another Brazilian jiu-jitsu specialist, longtime PRIDE contender Ricardo Arona at PRIDE 34. Sokoudjou was again the underdog in this fight but won via knockout after landing a huge uppercut. Sokoudjou signed with the UFC. He lost in his UFC debut to future UFC Light Heavyweight Champion Lyoto Machida at UFC 79 via arm triangle choke in the second round. As a homage to the many photoshops of him on the internet, he entered the ring wearing a predator mask. On May 24, 2008, Sokoudjou rebounded from his loss by defeating Japanese judoka Kazuhiro Nakamura via TKO at UFC 84 in the first round, after Nakamura hurt his leg. During his post-fight interview Sokoudjou challenged Mauricio Rua. Sokoudjou's next fight was at UFC 89 against dangerous striker Luiz Cané. He lost via TKO due to punches with 45 seconds remaining in the second round. Sokoudjou was released from the UFC on November 28, 2008. Sokoudjou was defeated by fellow UFC veteran Renato "Babalu" Sobral at Affliction: Day of Reckoning via submission due to an Anaconda Choke in 2:38 of the second round. Sokoudjou defeated the South-African kickboxer Jan Nortje at Dream 9 by TKO (strikes) in round 1 of the Dream Super Hulk Tournament. Sokoudjou was heavily criticized for his post-fight actions where he landed a barrage of extra punches after the referee had already stepped in to stop the fight. Sokoudjou did, however, express remorse for his actions, and apologized to Nortje for the incident. Sokoudjou was slated to face Gegard Mousasi in the semifinals at Dream 11, however, due to an injury, Super heavyweight Bob Sapp stood in for Mousasi. Sokoudjou defeated Sapp via TKO (punches) in the first round, thereby advancing him to the finals against Ikuhisa Minowa. At Dynamite!! 2009 Sokoudjou lost to Japanese fighter Ikuhisa Minowa in the finals of the DREAM Super Hulk Tournament. In the first round Sokoudjou was clearly doing all the damage on the smaller fighter while Minowa attempted leglocks. At the end second round Minowa had Soukodjou in a kneebar but was cut off by the bell before he could adjust his grip. In the third round Minowa and Sokodjou both received two yellow cards (10% purse deduction for one) for inactivity 3 minutes into the round, but with 90 seconds left Minowa sent a wild flurry of missed punches sending Sokoudjou into the ropes and connecting with a big left hook that dropped Sokoudjou causing referee Moritaka Oshiro to stop the fight. Then on May 14, 2010, he defeated Dave Herman by disqualification in the quarter finals of the Abu Dhabi Fighting Championships. Dave was disqualified for repeated knees to the head of a downed Sokoudjou. After this win, Sokoudjou picked up another win in the Australian promotion Impact FC, as he dominated and defeated Joaquim Ferreira by TKO in the 1st round. Sokoudjou faced the heavy-handed former UFC veteran Houston Alexander on September 11, 2010, at Shark Fights 13. Sokoudjou landed hard leg kicks at the start of the fight, before landing a lunging left hand that dropped the Omaha native. Sokoudjou followed this up with more punches to Alexander's head, who used wrestling to keep himself from getting knocked out and was able to demonstrate amazing toughness by surviving Sokoudjou's brutal attack for the final three minutes of the round, even after being dropped a second time by a punch before implementing some ground and pound of his own at the end of the 1st round. Alexander also landed two illegal headbutts at the end of the round, and was warned by the referee but did not have any points taken away. In the 2nd round, Alexander came out and landed a series of hard jabs on the African fighter, who seemed to be tiring out. Alexander then landed more strikes before going into the clinch from which he rocked Sokoudjou with a series of punches before getting on top and landing many unanswered punches on Sokodjou, before the referee stepped in and stopped the fight at 1:31 in the 2nd round. On October 22, 2010, at the Abu Dhabi Fighting Championships, Sokoudjou lost to Shamil Abdurahimov by TKO at 2:17 of 3rd round. On November 9, 2010, at Israel FC: Genesis, Sokoudjou won against Valdas Pocevicius by unanimous decision. Sokoudjou fought Ryan Jimmo for the MFC Light Heavyweight Championship at MFC 31 on October 7 at the Mayfield Conference Centre in Edmonton, Alberta, Canada, losing by a controversial unanimous decision. On December 15, 2012, Sokoudjou faced Denis Komkin in a Heavyweight bout at Pankration: Battle Of Empires 2, in Khabarovsk, Russia. Sokoudjou won via KO in the first minute of round one. Sokoudjou fought Heavyweight prospect Konstantin Erokhin at Fight Nights: Battle Of Moscow 14, on December 7, 2013. He lost via KO in the first round. Sokoudjou was defeated by former Strikeforce Light Heavyweight Champion Gegard Mousasi via second-round TKO due to ground and pound on November 7, 2009, at Strikeforce: Fedor vs. Rogers. Sokoudjou faced European prospect Jan Błachowicz at KSW XV for the KSW Light Heavyweight Championship, After two rounds Sokoudjou landed 12 leg kicks, making Błachowicz unable to continue the fight. On November 12 Sokoudjou faced Jan Błachowicz in a rematch at KSW XVI, Sokoudjou lost via unanimous decision and the KSW Light Heavyweight Championship. In his next bout, Sokoudjou faced Russian fighter Denis Komkin. Sokoudjou won the bout after knocking out his opponent with a head kick. Sokoudjou then made his debut in ROAD FC against Seung Bae Whi and won by unanimous decision. In his next fight, Sokoudjou fought another Russian fighter, Evgeny Erokhin, who had defeated Valentijn Overeem in his last fight. Sokoudjou was defeated by TKO due to punches. Sokoudjou signed with Bellator MMA and made his promotional debut on June 6, 2014 at Bellator 121 against Terry Davinney. Sokoudjou won via rear-naked choke submission in the first round. Sokoudjou faced promotional newcomer Malik Merad on October 3, 2014 at Bellator 127. He won via TKO in the second round. Sokoudjou faced English fighter Linton Vassell at Bellator 134 on February 27, 2015. He lost the fight via TKO in the second round. In June 2015, it was revealed that Sokoudjou was released from the promotion. Sokoudjou faced Maxim Osipov in a kickboxing match on September 1, 2012 at UWC 20 in Southend, England. He lost via majority decision. Sokoudjou faced Maxim Grishin in a kickboxing match on February 23, 2013 at Fight Nights 10 in Moscow, Russia. He lost via split decision(29–28, 28–29, 28–29). Sokoudjou speaks French, as well as a few dialects in his home country of Cameroon. He currently lives in Southern California and has a brother. Before becoming a professional mixed martial arts fighter, Sokoudjou worked as a bouncer. Win 19–18 Jamie Abdullah TKO (punches) AFC / Kunlun Fight - Kunlun Fight MMA 16 October 28, 2017 2 2:42 Melbourne, Australia Won the AFC Light Heavyweight Championship. Loss 18–18 Sergei Kharitonov KO (punch) M-1 Challenge 80: Kharitonov vs. Sokoudjou June 15, 2017 1 0:40 Harbin, Heilongjiang, China Heavyweight bout. Loss 17–15 Tomasz Narkun TKO (punches) KSW 36: Materla vs. Palhares Oct 1, 2016 1 4:38 Zielona Góra, Poland For the KSW Light Heavyweight Championship. Loss 16–14 Paul Buentello KO (punches) Abu Dhabi Warriors 3 October 4, 2015 3 3:21 Abu Dhabi, United Arab Emirates Heavyweight bout. Loss 14–12 Konstantin Erokhin KO (punches) Fight Nights: Battle of Moscow 14 December 7, 2013 1 2:28 Moscow, Russia Heavyweight bout. Loss 14–11 Evgeny Erokhin TKO (knees) Pankration: Mayor Cup 2013 May 25, 2013 3 4:40 Khabarovsk, Russia Heavyweight bout. Win 13–10 Denis Komkin KO (head kick) Pankration: Battle Of Empires 2 December 15, 2012 1 1:00 Khabarovsk, Russia Heavyweight bout. Loss 12–10 Jan Błachowicz Decision (unanimous) KSW 17: Revenge November 26, 2011 3 5:00 Lódz, Poland Lost KSW Light Heavyweight Championship; Fight of the Night. Loss 12–9 Ryan Jimmo Decision (unanimous) MFC 31 October 7, 2011 5 5:00 Edmonton, Alberta, Canada For MFC Light Heavyweight Championship. Win 11–8 Jan Błachowicz TKO (retirement) KSW 15: Contemporary Gladiators March 19, 2011 2 5:00 Warsaw, Poland Won KSW Light Heavyweight Championship. Loss 9–8 Shamil Abdurakhimov TKO (punches) ADFC: Round 2 October 22, 2010 3 2:17 Abu Dhabi, United Arab Emirates 2010 Openweight Grand Prix Semifinal. Loss 9–7 Houston Alexander TKO (punches) Shark Fights 13: Jardine vs Prangley September 11, 2010 2 1:31 Amarillo, Texas, United States Fight of the Night. Win 9–6 Joaquim Ferreira TKO (punches) Impact FC 1 July 10, 2010 1 1:20 Brisbane, Australia Heavyweight bout. Win 8–6 Dave Herman DQ (illegal knees) ADFC: Round 1 May 14, 2010 2 N/A Abu Dhabi, UAE 2010 Grand Prix Quarterfinal; Herman was DQ'd for kneeing Sokoudjou in the head while grounded. Loss 7–6 Ikuhisa Minowa KO (punch) Dynamite!! 2009 December 31, 2009 3 3:29 Saitama, Japan DREAM Super Hulk Grand Prix Final. Win 7–4 Bob Sapp TKO (punches) DREAM 11 October 6, 2009 1 1:31 Yokohama, Japan DREAM Super Hulk Grand Prix Semifinal. Win 6–4 Jan Nortje TKO (punches) DREAM 9 May 26, 2009 1 2:30 Yokohama, Japan DREAM Super Hulk Grand Prix Opening Round. ^ "Fight Finder: Rameau Thierry Sokoudjou dit l' assassin africain". Sherdog. Retrieved 2007-08-15. ^ "April 2007 interview by Pride" (in Japanese). ^ Crecy, Aaron (2007-04-06). "Who is Sokoudjou?". TheFightNetwork.com. Archived from the original on 2007-09-26. Retrieved 2007-04-09. ^ "Report: Rameau Thierry Sokoudjou dropped from the UFC". MMAJunkie.com. 2008-11-28. Archived from the original on 2012-07-10. Retrieved 2008-11-28. ^ "Report: I should have stopped". MMAJunkie.com. 2009-05-30. Retrieved 2009-05-30. ^ "Bob Sapp To Face Sokoudjou At Dream 11". MMAWeekly.com. September 9, 2009. Retrieved 2011-07-31. ^ "Sokoudjou Signs to Challenge 205-Pound Champion Ryan Jimmo at MFC 31". MMAWeekly.com. August 4, 2011. Retrieved 2011-08-04. ^ "Konstantin Erokhin vs. Rameau Thierry Sokoudjou". Tapology.com. December 7, 2013. Retrieved 2013-12-07. ^ "Gegard Mousasi vs. Rameau Thierry Sokoudjou completes Strikeforce's Nov. 7 CBS lineup". mmajunkie.com. Archived from the original on 2009-10-12. Retrieved 2009-10-09. ^ "Rameau Thierry Sokoudjou vs. Malik Merad". tapology.com. ^ "Bellator 134 Fight Card". bellator.com. Archived from the original on 2014-12-28. ^ Steph Daniels (June 4, 2015). "Bellator releases Sokoudjou and 7 other fighters from their roster". bloodyelbow.com. ^ "Результаты "Битвы под Москвой 10" - 24.02.2013" [The results of the "Battle of Moscow 10" - 02/24/2013]. fightnights.ru. 24 February 2013. Retrieved February 23, 2013. ^ Dave Walsh. "Weekend Results from Russia: Mineev, Allazov, El Gaoui, Ignashov Win". liverkick.com. ^ Ed Kapp. "Rameau Thierry Sokoudjou: KSW Champion Sits Down for an Exclusive Interview". Bleacher Report. This page was last edited on 23 December 2018, at 14:50 (UTC).